Sparing just five minutes of your time, you need to fill in a hassle-free order form at first. Tell us all about your specific requirements on the order form. 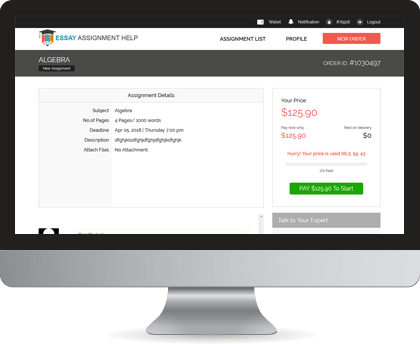 Try to be as detailed as you can for we will follow all your instructions to the T. Do not hesitate to state your exact requirements, and once you submit the filled-in order form, you will get a price quote for your assignment. 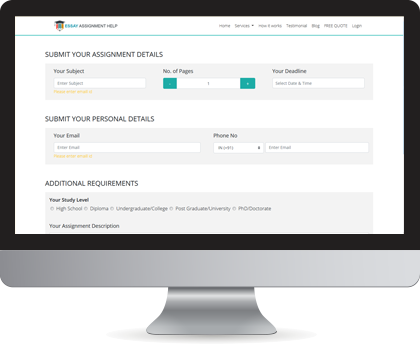 Once you receive a price quote for your essay assignment solution, you need to proceed to the payment section. At the payment stage, you will find a plethora of safe payment options to choose from in our secure payment gateway. You can opt to pay with online banking, your credit or debit card or your PayPal account, whichever is convenient for you. All you have to do now is wait for your completed and A-grade essay assignment solution to arrive. Our team of deft academic experts are super-speedy, and they make sure that you do not have to wait too long. 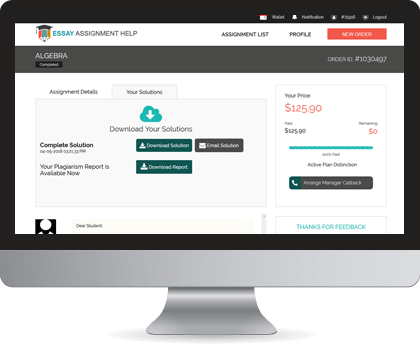 You will receive the professionally-written and customised assignment solution well within the deadline in the students' account that you create with us and be relieved of all your study stress forever!